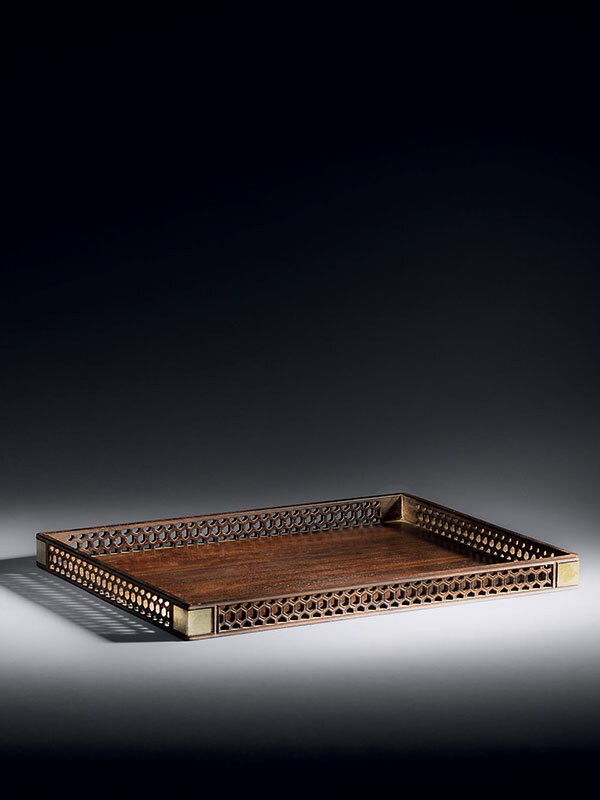 A zitan tray of rectangular shape, with straight side railings and a solid panel base. The sides are carved in openwork with hexagonal, honeycomb pattern. The four corners are reinforced with white metal in plain, rectangular shapes. The wood is well polished, and the zitan displays the typical purplish hue with characteristic minute silvery streaks. The present Chinese stationery tray is a fine example of a scholar’s piece made of precious wood, zitan (‘purple sandalwood’). Zitan is the densest and slowest growing of hardwoods used to create objects for the scholar’s desk, and occurs rarely, due to size limitations and the delicate nature of the wood. Stationery trays, also known as scholar’s trays (ducheng pan in Chinese) were used to present a variety of utensils on a scholar’s desk, to organise objects necessary for brushwork, so they could be easily moved together. They also were used partly for the purpose of display. Scholar’s objects, including brush rests, brushes, small water pots and washers, ink cakes and stones could all be assembled here in an orderly fashion. 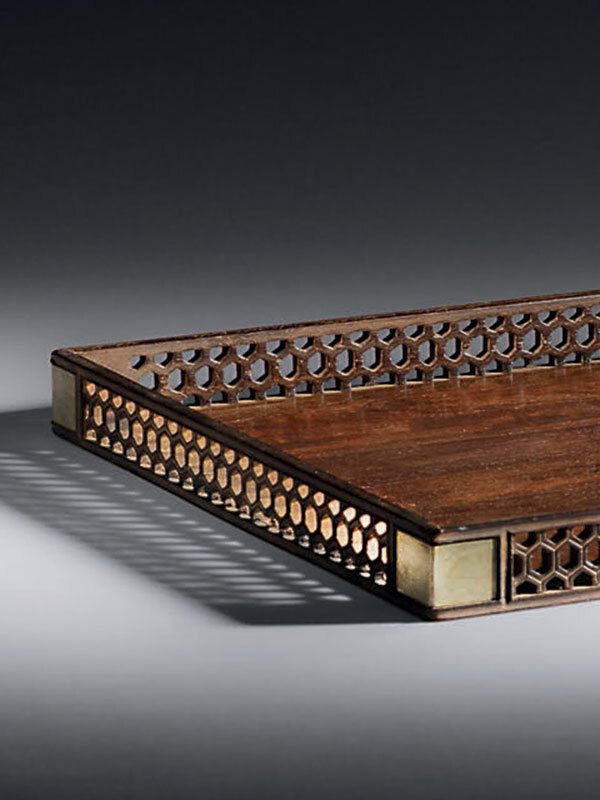 Examples of stationery trays are in the Qing Court collection: a bamboo-veneered tray together with a set of writing materials is now in the collection of the Palace Museum, Beijing;  two wooden trays together with jade and cloisonné pieces are displayed in the main section of the Mental Cultivation Hall in the Forbidden City. Two published zitan trays, both dated to the 18th to 19th century, are comparable to the present example in size and their openwork side railings: one was included in the 1986 exhibition Arts from the Scholar’s Studio; the other is illustrated in the publication Classical Chinese Furniture- A Legacy of Refinement.